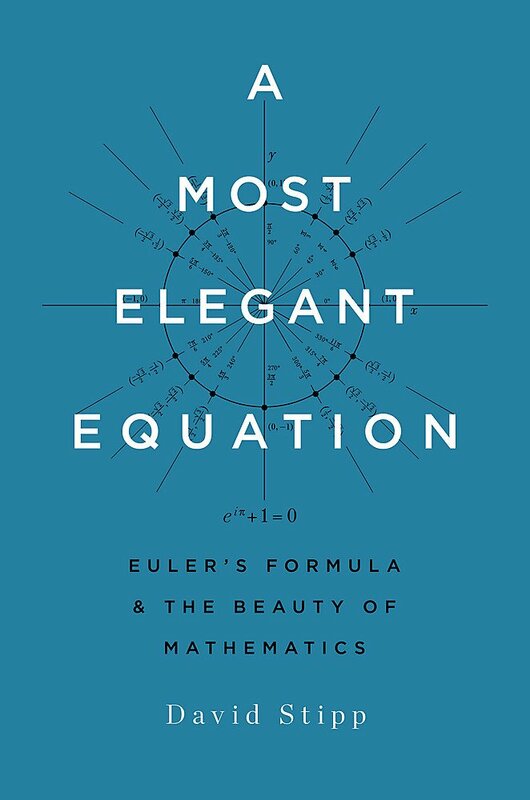 Aside from E = mc2, there is no other mathematical formula that has had more books dedicated to it than Euler's equation, eiπ +1 = 0. In some ways it's not surprising - like Einstein's equation, Euler's is simple, yet combines essential quantities in a way that surprises and has interesting uses. 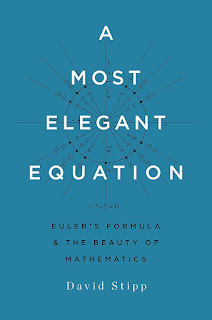 Not long ago I read Robin Wilson' Euler's Pioneering Equation, which started really well with some good history of maths on the main components of the equation, but then became too complex for the typical non-mathematician. I'm pleased to say that David Stipp in A Most Elegant Equation doesn't fall for this same trap. This book remains easily readable throughout. Stipp also takes us through a little of the background to the main components of the equation (though in a far more summary fashion for 1 and 0). It would have been nice to have had a little more history of maths to round out these introductions - as it was, what you get is plenty to understand e or i, for example, but a little more context would have been pleasing. One thing he does do well here, though, is give us some nice biographical detail on Euler himself. Where Stipp triumphs, though, is continuing to make the whole process accessible as we discover where the equation comes from and what it (and the more generalised version of the equation) is capable of doing for oscillating values such as waves. Stipp takes us through step by step from the basics of definitions of i and sines and cosines, through the use of radians and the way that the complex plane combined with the rotational interpretation of sine and cosine make this approach so powerful. (If any of that doesn't make sense, it will after you've read this book). To get a picture of why so many mathematicians and physicists think this equation is beautiful, what the equation does and what lies beneath it, A Most Elegant Equation is hard to beat. There's even a section looking at why a few rebels think the equation is rather boring... and what's wrong with their assertion. I'm not saying this book will make every maths-hater suddenly decide the topic is fascinating. But for anyone who is puzzled by mathematicians talking about beauty, or who knows enough to be surprised at the way these disparate quantities come together without having the mathematical background to explain it, this will make a short but sweet read.